I can hardly even write this because most of these terrify me. Check out 2016's 5 creepiest Halloween doll props that you can find online. Come check it out if you dare! 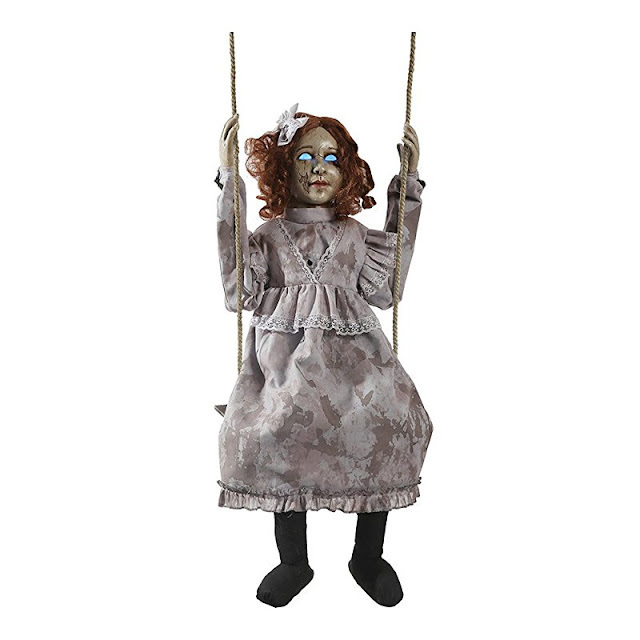 You can't sit there and tell me that the Lil Sweet Vengeance Doll prop isn't frightening! That expression is absolutely malevolent and definitely looks like it's possessed! Those who are daring can put this doll prop in their yard or even in their house. The eyes are actually glowing which makes her look even more dreadful. This swinging decrepit doll prop needs to be hanging, alone, in the middle of a dark and ominous yard. If I saw this in your yard, I would have to flee! Even though the swinging doll doesn't appear as evil as the doll above, but that's the problem. Those glowing blue eyes are just looking to cause trouble. Don't you think that this bear-holding creepy doll is a little much? I can't handle those eyes bulging out while she's looking up at you. It's just too eerie and would really freak me out. 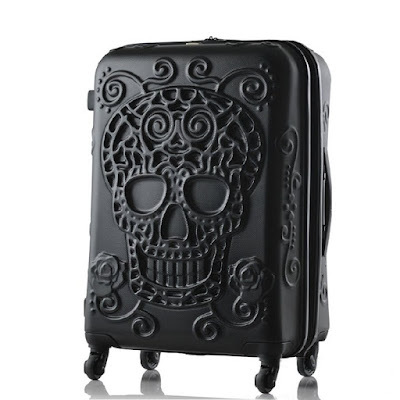 Especially if this was placed inside the house around a corner or in an obscure room! It doesn't help that she's wearing Victorian garb.. shudder! 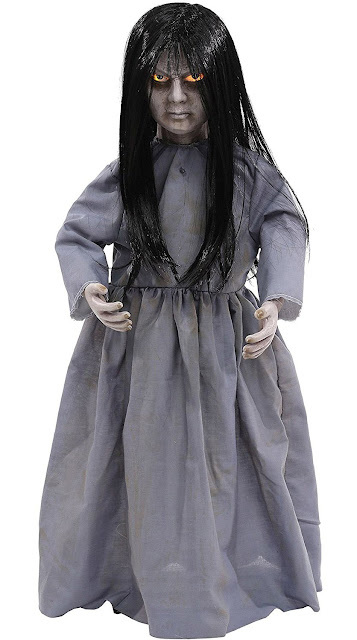 I think that this Victorian doll prop is the least scary, but those purple eyes are definitely out of this world. Not in a good way either - she definitely looks like some evil force has possessed her. It doesn't help that she's wearing Victorian garb, which is a bit terrifying! She is also available on eBay! 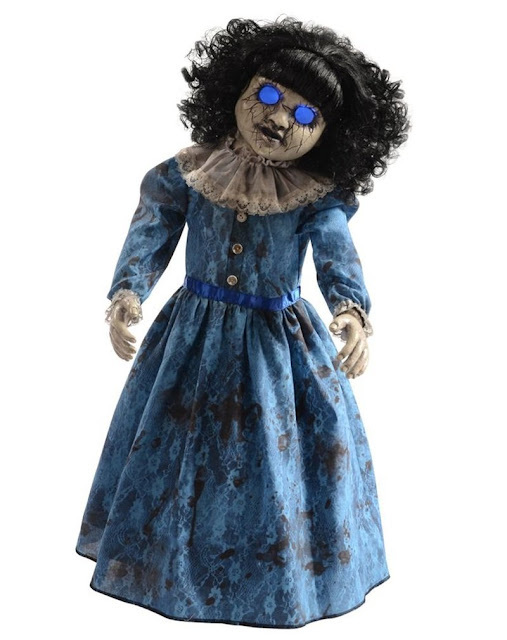 The black cracking along this blue antique doll's face looks sinister. I can just feel myself looking behind my chair feeling those blue eyes leering at me. Why do they make props this scary? It really should be a crime. 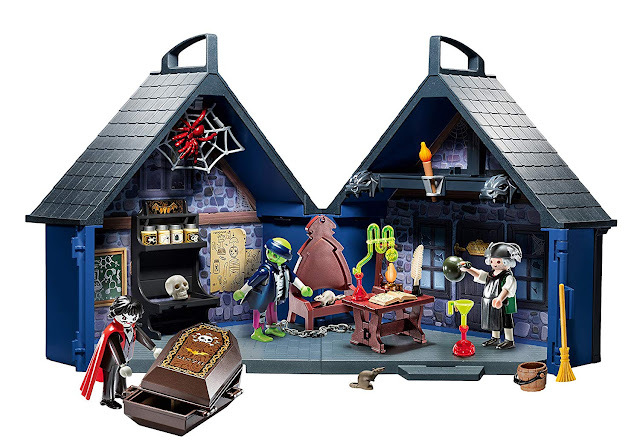 Are you looking for some scary props for your home? I recommend these Halloween doll props if you're looking to chase away trick or treaters this year. Which one do you find to be the freakiest? Comment below!